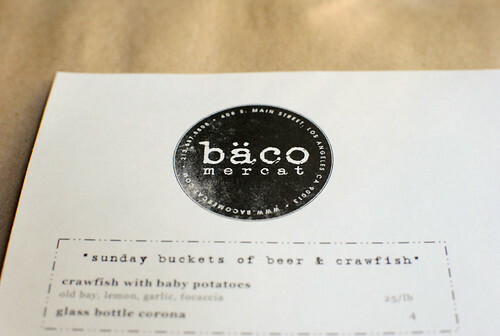 I first visited Baco Mercat a few months ago and left underwhelmed. It may have been partly due to the hype surrounding the restaurant and its namesake baco sandwiches, but I just didn’t understand what was so special about them. I’ve returned a few times for lunch and slowly warmed up to the place. This latest visit for brunch, my fourth, was maybe my best meal yet here. Baco Mercat has been open for brunch on Saturdays for some time, but this happened to be the first Sunday they were open. 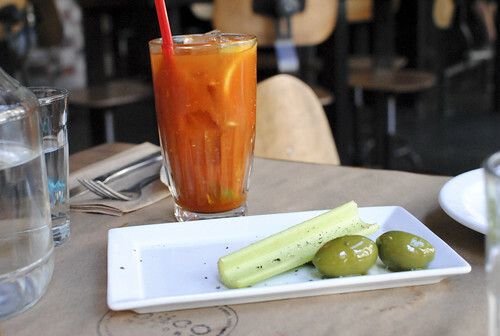 To distinguish Sunday brunch service, the restaurant is serving something they’re calling ‘crawfish and beers.’ A large platter of crawfish (sold by the pound) is served with focaccia. The recommended beer pairing is Corona, but I’d really recommend one of the selections from their modest craft beer list. Since there were only two of us dining, and since I kind of hate peeling these little guys, we opted to pass on the crawfish and dine on the smaller plates, many of them unique to brunch. 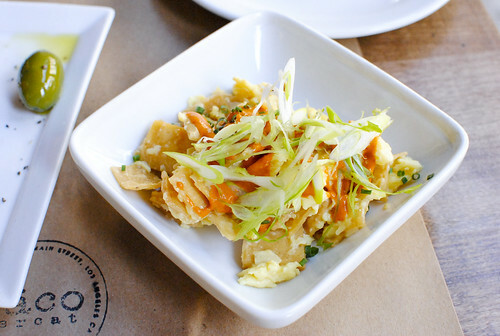 Fried crispy tortillas were topped with delicate, soft scrambled eggs and a spicy sauce (aioli?). Some fresh scallions did a nice job of cutting through some of the richness; these were some nice well-balanced bites. This was a must-try; the signature sandwiches incorporated the classic breakfast burrito in what sounded like a sure hit. 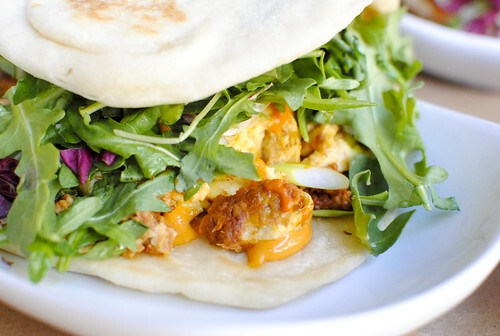 And, I’m happy I say it was, with the savory chorizo and eggs being the strong tandem I expected. 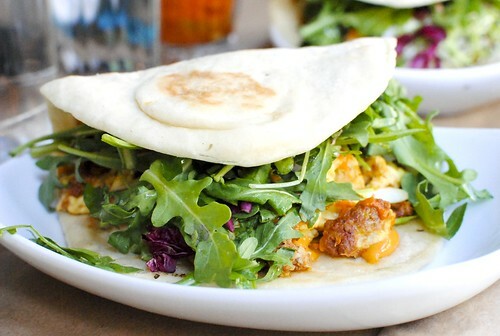 The arugula was a difference-maker, adding its distinctive peppery bite to help balance out the flavors of this gourmet breakfast burrito. I would’ve loved to see some hash browns in here though. 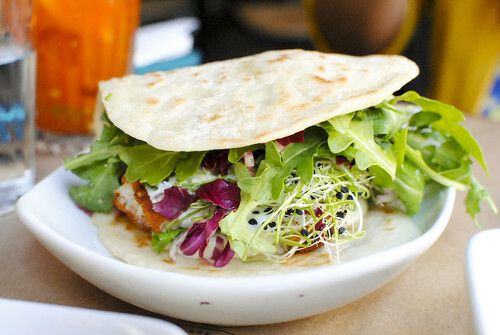 Named as the best sandwich in Los Angeles in one LA Weekly article, this may be the most famous baco. 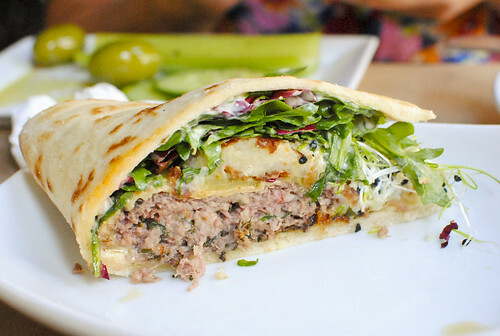 With oxtail hash at the center of the sandwich, it’s not hard to see why. Meaty oxtail and crispy potatoes are combined with some leafy greens and arugula, packed with savory flavor. My friend found it a bit heavy-handed on the salt in some bites; it didn’t bother me so much, but I could see some having an issue with that. Baco Mercat’s most notable dishes are heavy and rich, but there are lighter options. This is one of them. 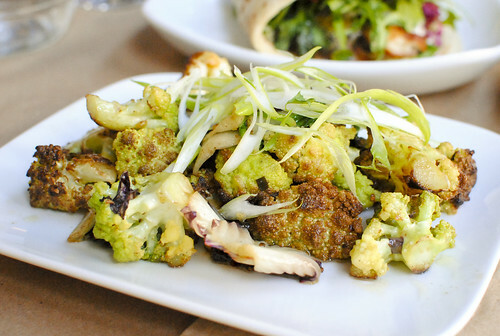 Romanesco was roasted with radicchio, topped with a drizzle of oil and lemon juice. Simple yet satisfying. 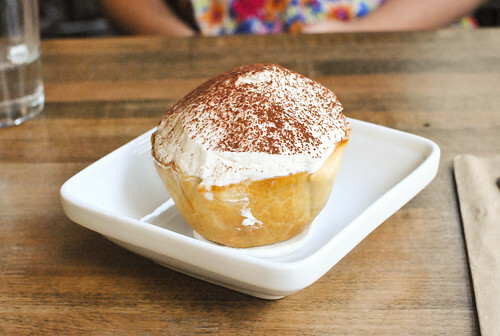 Jonathan Gold raved about this dessert saying it may be the best banana cream pie in the city. I haven’t tried nearly enough to make any sort of proclamation, but I thought this was a strong effort. It was a pretty light dessert (or as light as a banana cream pie can be), with a smooth and creamy banana custard at the base of a tart with a lot of whipped cream on top. The butterscotch at the bottom of the tart was probably my favorite flavor profile, reminding me of the rice pudding at Lazy Ox Canteen (Centeno’s old haunt) which is one of my favorite desserts in the city. Over the course of my four visits, I’ve been able to try much of the menu. For some reason, I feel like the individual baco have become more distinct and varied in their flavors. I think the original is my favorite (over the Toron), with its crispy fried beef and pork carnitas being quite the tandem. I don’t think the flatbreads are worthwhile given limited stomach space – I’ve found the the small plates to be much more satisfying (they tend to strongly resemble the small plates at Lazy Ox Canteen). wanna go wanna go wanna go!!! I need the banana cream pie. And damn the lighting is gorgeous on a Sunday morning. Swoon! Ideal for a Sunday brunch!